Fried chicken is probably the first dish one thinks of when asked to name Southern dishes. It ranks right up there with cornbread, greens, and grits. 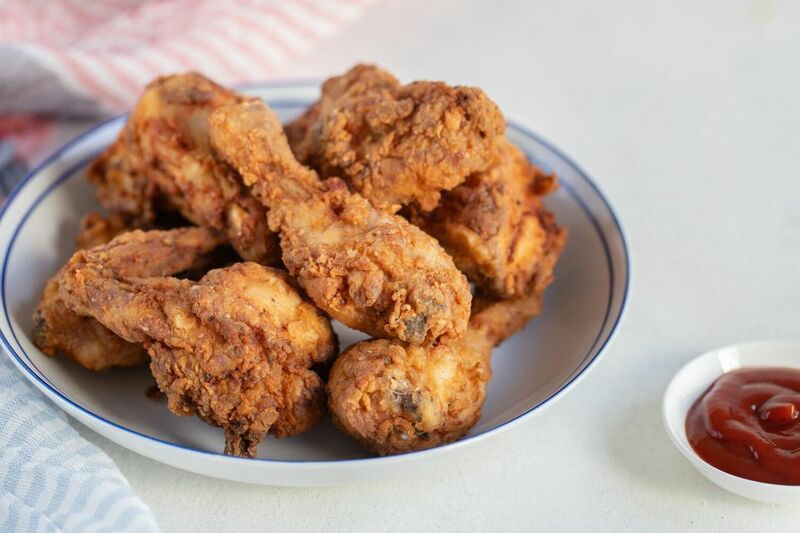 This is a basic Southern fried chicken recipe, and it is easy and delicious. Serve this crispy fried chicken with mashed potatoes and coleslaw, along with steamed broccoli or another favorite side dish. Use bone-in chicken pieces in this recipe. For boneless chicken breasts or cutlets, take a look at this recipe. Preheat the oven to 200 F and place a rack in a large baking pan. Combine milk and eggs in a bowl; whisk to blend well. In a large heavy-duty resealable plastic food storage bag, combine the flour, salt, and pepper. Dip a chicken piece in the milk mixture; let excess drip off into the bowl. Put a few chicken pieces in the food storage bag and shake lightly to coat thoroughly. Remove to a plate and repeat with remaining chicken pieces. Heat oil in a deep, heavy skillet to 350 F.
Fry the chicken, a few pieces at a time, for about 10 minutes on each side, or until golden brown and thoroughly cooked. Chicken breasts will take a little less time than other pieces. Pierce with a fork to see if juices run clear to check for doneness, or use an instant-read thermometer. The minimum safe temperature for chicken is 165 F (74 C). With a slotted spoon, move to paper towels to drain; sprinkle with salt. Transfer the drained chicken to the prepared pan with rack. Move the chicken to the oven to keep warm while frying subsequent batches. Leftover fried chicken can be reheated with good results. Take the chicken out of the refrigerator and bring it to room temperature. Heat the oven to 400 F. Place a rack on a baking sheet. Put the chicken pieces on the rack and bake for about 15 to 20 minutes. Replace the milk with evaporated milk or buttermilk. Replace the salt and pepper with a seasoned salt blend. Add about 1/2 cup of find dry breadcrumbs to the flour mixture.